Have you had that feeling when you have your holiday dinner perfectly planned out…and then someone calls and says they’re gluten-free? Or worse yet, have you found a gluten intolerance in the last few months that’s forced you to swear off the wheat protein? Don’t fret. Gluten-free cooking has come a long way. In fact, it’s a lot easier than you think. If you take the proper measures, none of your delicious dinner courses have to suffer. Follow these simple steps to preparing the ultimate gluten-free meal and no one will be the wiser. Instead of running around like a chicken with your head cut off looking for gluten-free alternatives to the dishes you already had in mind, just re-tune your menu to include whole, naturally gluten-free foods. If your meal shifts to being more whole-food focused, you will want to make sure you’re getting the best meats and produce available. Big, brand-name stores tend to get their produce way in advance, meaning it ripens while en route to its destination and can lose much of its nutrients. Look for these items at a local grocer that sources its meats and produce from local farmers to guarantee freshness. You don’t have to completely swear off grains to make a gluten-free meal. Try grains that are inherently gluten-free instead of looking for substitutes if you can. Choose dishes like rice, risotto, quinoa, polenta, and corn-based products. Not only will these dishes make delicious additions to your holiday dinner, they can also make it a little healthier for those starting their New Year’s resolutions a little early. Knowing what to cook is just as important as knowing what not to. There are a lot of obvious gluten invaders, but some common foods contain hidden amounts that can be problematic. Obviously, foods that include white flour are a no-go. You’ll also want to steer clear of wheat berries and bran, rye, barley, spelt, cous cous, pasta, malt, and beer. These don’t all necessarily have gluten, but it’s worth checking the label before using them in your recipes. There are often gluten-free versions of these foods, or you can make your own at home, to avoid the problem all-together. Baking isn’t as simple when you need to make a gluten-free dessert. You can’t just switch out regular flour with the gluten-free equivalent, unless you want a discombobulated mess all over your kitchen! It depends on what your flour is made of (is it chickpea or almond meal?) and what other ingredients are going into your dish. Various flour alternatives react differently to certain ingredients, and a little practice is needed to get the gluten-free recipe just right. To simplify your task, avoid recipes that highlight flour as a main ingredient. And when you do cook with flour, add some ground almonds, oats, or coconut flour to the gluten-free powder. It will add a little flavor and act as a moistener to hold your ingredients together better. If you’re preparing a mix of regular and gluten-free dishes, it’s important to make sure you don’t cross contaminate your cooking tools. Just as you would with raw meats or any other food allergy, make sure counter tops are thoroughly cleaned and sanitized before preparing gluten-free foods there, and use different utensils to avoid accidentally introducing gluten to a wheat-free dish. 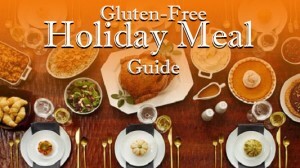 Being gluten-free doesn’t mean holiday dinners are reduced to mashed potatoes and green beans. Although a few foods may be difficult to convert, it’s actually fairly easy to create a gluten-absent meal. Cook with caution and give yourself some extra time in case a dish doesn’t turn out as planned on the first-try. And remember, you can find all of the fresh produce and meats you need at your local Reams grocery store!